The 5th edition of Marketing Without Advertising is now free online in many sites. The current edition on the market is the 6th edition for $13.60 from Amazon and $9 in the Kindle version. The 6th edition has a heavy focus on building your business with the Internet. Almost every business needs to be current on the Internet. This blog also keeps current with Internet and other marketing developments. 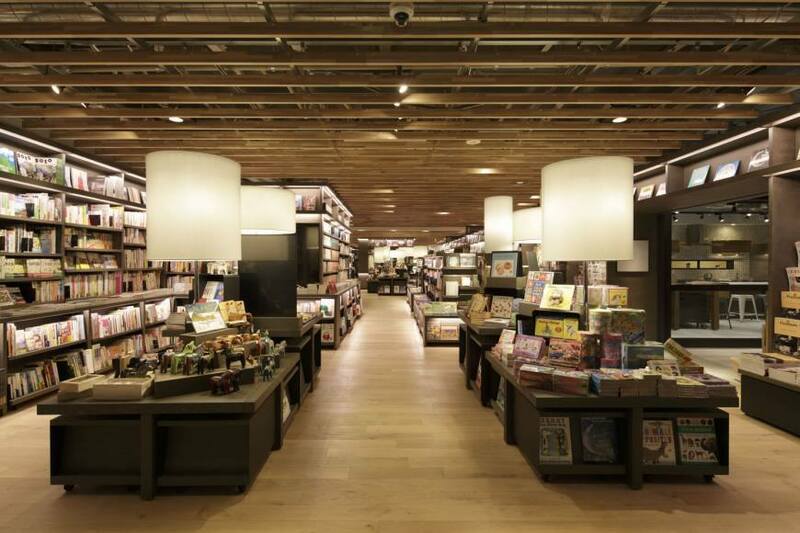 After wowing hipsters the world over with the first T-Site in Tokyo’s upmarket Daikanyama district three years ago, Tsutaya continues its quest to stop being the Blockbuster of Japan and be taken seriously as a sophisticated retailer: Shonan T-Siteopened in mid-December, a complex of over 30 stores. Like its Tokyo predecessor, the new T-Site in the beach resort area of Shonan, some 50km from the capital, is sleek and curated, with an uber-hip bookstore, restaurants, cafes, an Apple reseller, and even a posh FamilyMart convenience store. The same design team, led by architecture studio Klein Dytham, is behind the latest addition to Culture Convenience Club’s money-spinners. So the white cubes from the Daikanyama complex are still here, along with the range of curated retail options. What is different is the location, of course, since Shonan is a beach area full of surfing and sun. That said, the money is still there, since Shonan is a plush area home to the well-to-do who can afford the long commute to Tokyo (think the elite families who gave us the taiyo-zoku in the 1950′s), and Tokyoites with second homes in the peninsula. Shonan T-Site is actually part of something bigger and quite exciting — Fujisawa Sustainable Smart Town (FSST), a model town for the future being developed by Panasonic. You can grab a coffee at the customized designer Starbucks or indulge in some designing of yourself since, following in the craze arguably started by the likes of Fab Cafe in Shibuya, you can use 3D printers and laser cutters in the upstairs lounge area, or even try out Panasonic home appliances in a special tryvertising space called Square Lab Ferment. The Daikanyama complex was touted as an attempt to meet the retail needs for middle-aged or older moneyed urbanites in search of experiences worthy of Daikanyama — quiet, curated, expensive. That said, its demographic is always mixed, full of younger couples on dates in Daikanyama, though they may not necessarily make a purchase. Shonan has some of this too, since the population is older and life is slower, but there are also plenty of young visitors in the summer, who may want to combine a trip to Enoshima beach with some browsing at T-Site. Look for it to get busier as the weather get warmer. The photos on this were taken at a Uniqlo store in San Francisco. I go to Japan every year so I saw the first Uniqlo store there, not too many years ago. I bought several long sleeve shirts because they were low priced and high quality. Uniqlo has grown to be a global retailing giant. It is now forth in gross revenue after H & M (Swedish), Zara (Spanish), and Gap (San Francisco). Uniqlo is growing the fastest. This is the most comprehensive article on the marketing methods of the four stores. Zara is the most automated and can catch trends the fastest. Uniqlo is the most analytic and goes for a trend in a core style. Last year Uniqlo opened a new 8 story store in Ginza. On each floor above the first were a row of rotating mannequins behind a glass wall. Inside the store were similar mannequins arranged to show the goods on each floor. The heavy use of mannequins seems to be a Uniqlo innovation. On this page I have photos of the use of mannequins in Uniqlo stores, even on the upper walls. The most surprising is the use of miniature mannequins on the outside of the store, a tiny version of the Ginza store. To me, the use of mannequins to show the near infinite variety of combinations of clothes that are stylish and possible, appeals to the current fashion trend to: 'be unique but still well put together'. It is a way to stimulate fashion imagination and make a limited store inventory look very large. I was included in the last American Community Census. I filled out the online questionnaire after a little technical trouble which I never expect a government agency to be able to deal with. Bureaucracies and computers are not compatible. A bureaucracy is made up of countless warring factions and the programmers never do know who to listen to. That is not the issue here. The issue is that I have been designing high quality surveys for the past 40 years as an expert in the field. I have conducted a vast number of surveys including several where I was in the field myself and several where I supervised the field interviewers. I have used every medium from face-to-face interviews, to focus groups to postcard questionnaires. This particular problem arises from the fact that the Census people have no conception of self employment. None whatsoever. They do not have categories for the dozens of types of self-employment. They give no priority to the self employment category and its overlap with other earning categories. Yet this is the category with the greatest amount of growth and jobs and vitality in American society. Lastly, while they are using a computer for answers, they make no effort to include alternatives such as "other" with a pulldown for explanation or "none of the above" with a pulldown for explanations. The clear reason for their very rigid and inappropriate questionnaire is their sample of several million is too gigantic for them to process the answers. A sample this size with poor questions is consequently irrelevant. Sampling 2 million people with the wrong question is not in the same category of reliability as sampling 200 people with the right question. The latter is always preferred by those of us who know statistics and survey research. My job in life is not to criticize an incompetent bureaucracy. A proper study could be done with a small in-person proper random sample. Sample size would not need to be over 5000 completed interviews. The accuracy would be greater than anything currently done anywhere in the world. The survey interviewers would have to be educated and experienced survey researchers who are required to make written comments about each response. Top flight survey firms such as NORC do this. I know it will take time but someday we will have a reliable national census data base that will underlie the tens of thousands of commercial survey research studies that make use of standardized national data. If you want to see beautiful interior retail design look at Starbucks in Japan. GU (pronounced “gee-you” — a play on jiyu, meaning “free”) is the off-shoot of UNIQLO that is even cheaper and even more casual. GU branches have been popping up around major city centers recently and as part of its expansion, it has launched a series of guerilla marketing schemes to pull in the crowds. These include flash mob events, fashion shows with “living” show window mannequins, and more. It was also one of the sponsors of the Kawaii!! Matsuri 2013, which prominently featured GU’s official model, Kyary Pamyu Pamyu. Since GU’s line is meant to be clothes worn by laidback fun-loving youngsters, in Kobe it decided to hold a “fashion dance battle” with teams of kids. 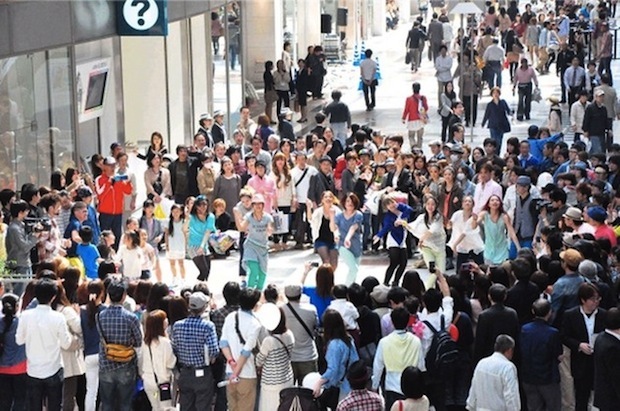 Meanwhile, in Hakata (Fukuoka), it held a flash mob event. Flash mobs have been taking place a lot in Japan recently, both as genuine social “happenings” and also as promo events. Meanwhile, in Ikebukuro in Tokyo and Shinsaibashi in Osaka, the GU held a live fashion show in its shop window, and broadcast on Ustream. Check out the three super genki foreign models, who are meant to be “living” mannequins. GU opened its two hundredth store in late December and is set next to move overseas. It also changed its branding logo from “g.u.” to “GU”, which it hopes will help it stand out more when it expands beyond Japan. Most businesses have a steady stream of new customers replacing customers who left. That replacement is called churn. In some instances that churn is nearly 100% as is the case with much retail and restaurant business. In other instances there is very little churn as is the case with telephone contracts, utilities and accounting firms. Businesses such as banks, department stores, shopping centers and coffee shops are in the middle with churn as a definable reality of business. In my first post-college job, starting the marketing research department for the Bank of America, I noticed that churn for this largest California statewide bank was very high. Nearly 1/3 of customers opened and closed accounts every year. I pointed out to management that simply reducing the number of customers leaving or finding a way to get them to return to the bank would be a major source of customer growth. Management had no interest because most of the churn was in retail customers and only corporate customers were considered important. For most of my clients, over the past 40 years, retaining customers became the most important source of growth. That is why Marketing without Advertising puts so much emphasis on helping customers explain their problems to the business management before they leave and giving them vast recourse opportunities if anything goes wrong. Don’t let them leave because of dissatisfaction, if possible. Think about how fast your business could grow if the number of customers leaving were cut in half. In this era of Internet business it should be even easier to reduce churn. There are two retail stores that I want to call to your attention. As is true all over San Francisco, there is a wide variety of unusual ice creams at this store. What makes this retail outlets so unique is the bar at the back which is stocked with an arsenal of tinctures and syrups. The mixologist does what ice cream bars in old fashion drugstores used to do. Before refrigeration was cheap and ubiquitous, the way a cold drink was made was to drop acid phosphate into soda water to create a bubbling, refreshing drink. All sorts of tinctures such as oil of lemon are put into the phosphate drink. Coca-Cola was originally a phosphate drink. Ask at The Ice Cream Bar and have one made for you.... make it a float too. This is a wonderful store that lets you understand why drugstores were the home of soda fountains and ice cream. It is a brilliant business, the kind that San Francisco is so prolific in creating. San Francisco had already created the modern world of mixed drinks as a response to the perverted alcohol laws that treated the Japanese shochu as a wine (described in an earlier blog). There is a new retail outlet in Venice Beach California that is equally innovative and representative of the kind of businesses generated on the Westside of Los Angeles. It is called Deus ex Machina. I will not say what that Latin phrase means to my sophisticated readers. The shop is a motorcycle coffee bar that also sells motorcycle accessories and has a motorcycle repair shop in the rear. The espresso is good. Deus ex Machina is a slow development that took many years to come to fruition as an idea. Espresso entered our American daily lives 20 years ago with Starbucks. Starbucks entered the market at the top of the status ladder by carrying the New York Times and jazz. Deus ex Machina is here to show us that real style is at the bottom of the status ladder among motorcycle fans. Of course this is America, where status has always been treated as a joke and this retail outlet is the perfect ironic joke. It is beautiful and well designed, just like a motorcycle. I recently had my expensive sushi experience. The sushi chef is not the one who has a movie made about him and operates a sushiya with 10 seats and three Michelin stars. That shop is near Ginza. Meals there are $400 per person. My sushi chef has a 12 seat restaurant and the meals are only $200 per person. This sushi of course is extraordinary. This shop is in Shimbashi. This chef was awarded last year’s top Japan sushi chef award. The reason I bring this to your attention is because Mr.Nagayama, Katsu does something that I considered to be the act of a marketing genius. Every evening there is a large piece of rice paper on the wall with the name of the seafood to be served in the top column, followed by a description of how the food was caught, in detail whether net or long line or hook, as well as the wholesale supplier and the locale of origin either a town or a segment of ocean. One piece of the tuna came from a fish caught off of Ireland. I call this document the Provenance of the food. there are many other types of business that could display such a document of provenance from fancy American restaurants to shoe stores. It is a brilliant way to connect customers to their products. Chef Nagayama happens to write his providence document with an extremely beautiful calligraphic hand. I don’t expect that from anyone else. The attached photo is a tiny shop in Tokyo. The product is not clearly visible in the photo. You can buy a bottle of champagne or a glass slipper with champagne that is sandblasted with the message you want. Messages such as happy new year, happy birthday and congratulations with the name of the recipient or photo. This is an excellent business for the Internet. The problem is showing good demonstrations in retail outlets. to pay a commission to the retail store. This is a happy blog. My homeowner’s insurance company, CIG, made a mistake and deducted the same monthly fee twice. The company immediately put one charge back in my account. I never noticed until two weeks later, while reconciling the account. The company sent a letter of apology offering to pay any expenses that had been incurred by the mistake and enclosed a $10 Starbucks card. Good recovery from an inadvertent mistake. I call that recourse in my marketing book. All businesses make mistakes, how they handle them is the measure of competence.